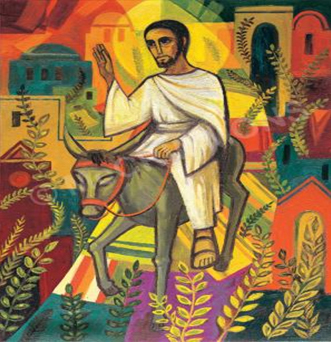 Please see today’s Cultural Resources unit for ideas for Arts and Worship Departments for Palm Sunday. Leader: Give thanks to the Lord, for He is good; His love endures forever. Leader: It is better to take refuge in the Lord than to trust in man. Congregation: Open to me the gates of righteousness; that I may enter through them and give thanks to the Lord. Leader: This is the gate of the Lord, the righteous shall enter through it. Congregation: I will give you thanks, for you answered me; you have become my salvation. Leader: The stone the builders rejected has become the cornerstone; this is the Lord’s doing, and it is marvelous in our eyes. Congregation: This is the day the Lord has made; let us rejoice and be glad in it. O Lord, save us; O Lord, grant us courage. Leader: Blessed is He who comes in the name of the Lord. From the house of the Lord we bless you. Congregation: The Lord is God, and He has made His light shine upon us. With boughs in hand, join the festal procession up to the horns of the altar. Leader: You are my God, and I will give you thanks; you are my God, and I will exalt you. Congregation: Give thanks to the Lord, for He is good; His love endures forever. Congregation: They answered as Jesus had told them, and the people let them go. So they brought the colt to Jesus and spread their cloaks on it, and he mounted. Leader: Some of the Pharisees in the crowd said to Jesus, “Teacher, rebuke your disciples!” “I tell you,” He replied, “If they keep quiet, the stones will cry out.” When Jesus entered Jerusalem, the whole city was stirred. “Who is this?” people asked. (d) All Hail the Power of Jesus’ Name. By Edward Perronet. Tune, (DIADEM). Donnie McClurkin. New York, NY: Warner Alliance, 1996. Cage, Byron. An Invitation to Worship. New York, NY: Gospocentric, 2005. Crouch, Andraé. Journey. Los Angeles, CA: Riverphlo Entertainment, 2011. Smallwood, Richard with Vision. Persuaded—Live in Washington, D.C. New York, NY: Verity Records, 2001. Walker, Hezekiah and the Love Fellowship Choir. Souled Out. New York, NY: Verity Records, 2008. Butler, Jonathan. The Best of Jonathan Butler. New York, NY: Jive/Gospocentric, 1993. The Rebirth of Kirk Franklin. New York, NY: Jive/Gospocentric, 2002. Gaither, Bill and Gloria. Israel’s Homecoming. EMI Christian Music Group, 2005. Rev. Timothy Wright Memorial Choir. Godfather Records/DW Project Music, 2011. Nu Hymns for the Motor City. Indianapolis, IN: Tyscot Records, 2001. Lawrence, Donald and the Tri City Singers. The Best of Donald Lawrence and the Tri City Singers: Restoring the Years. Brentwood, TN: EMI Gospel, 2003. Youthful Praise. Live the Praise Worship. Knoxville, TN: Evidence Gospel, 2005. Hall, James. Live from New York at Lincoln. New York, NY: Platinum Entertainment, 2008. West Angeles Church of God and Charles Blake. No Limit. Brentwood, TN: EMI Gospel Music, 2007. Walls Group. The Walls Group. Houston, TX: Wall2Wall Entertainment, 2011. Jakes, T.D. and the Potter House Mass Choir. Grace: Live in Kenya. Los Angeles, CA: Rhino, 2007. Campbell, Lamar & Spirit of Praise. When I Think about You. Brentwood, TN: EMI/Chordant, 2000. Clark-Sherard, Karen. The Heavens Are Telling. New York, NY: Elektra, 2003. Hammond, Fred. Hooked on the Hits. New York, NY: Verity, 2003. Jenkins, Charles and Fellowship Church in Chicago. The Best of Both Worlds. Chicago, IL: Inspired People, 2012.